Did you know that Tony Jaa disappeared (without telling anyone) into the jungle half-way through production, try to "find himself" or something like that? I believe prodiction had to shut down for quite some time. Interestingly it's not on IMDb Trivia page, but googling it yielded some results. Overview: After a plane crash, a young therapist, Claire (Oscar® Nominee* Anne Hathaway, Rachael Getting Married, The Devil Wears Prada), is assigned by her mentor (Andre Braugher, The MIst, City Of Angels) to help the flight's five survivors. When they share their recollections of the incident - which include an explosion that the airline insists didn't happen - Claire is intrigued by Eric (Patrick Wilson, Watchmen, Hard Candy), the most secretive of the passengers. Just as Claire's professional relationship with Eric grows into a deeper connection - against her better judgment - the survivors, one by one, begin to disappear mysteriously... and Claire suspects that Eric may hold all the answers. Claire becomes determined to uncover the truth, no matter the consequences. My Thoughts: A fairly standard psychological thriller with a number of twists in its tail. The first twist is more or less given away with the tag-line of the front cover. The second twist I didn't expect but the third I did sort of guess. Overview: A spectacular, dazzling and bloody re-imagining of Shakespeare's legendary Hamlet, 'The Baquet' is an epic tale of revenge, violence and betrayal. Locked in a loveless marriage Empress Wan (International superstar Zhang Ziyi) is desperate to keep her forbidden love for Prince Wu Luan (Daniel Wu), from a family divided by cruelty and oppression. When the Emperor suddenly dies, his conniving younger brother Li takes up the throne forcing Wan to marry him. Convinced that this is the only way to protect all she loves from being destroyed by this new power hungry tyrant, Wan agrees. But Wu Luan refuses to see his love snatched away through such evil, greed and deception. After repeated attempts on his life amid furious confrontations with the new Emperor's imperial assassins, Wu Luan resolves to return to the palace and take revenge for himself, his beloved and a nation in the grip of a murderous madman. Featuring astonishing, career-topping action from the infamous Yuen Wo Ping ('Kill Bill', 'The Matrix' and 'Crouching Tiger, Hidden Dragon') and a cast featuring some of Asia's most acclaimed cinema icons, 'The Banquet' is like no other epic you have ever witnessed. My Thoughts: As a martial arts film this was wordy, probably due to it being based on Shakespeare's Hamlet, rather than loads of action but I thought it was quite well done though. The action choreography seemed to be more balletic (is that a word) with many spins, pirouettes, leaps and bounds as well as the obligatory cut and thrust. I don't know if there is a longer director's cut, I couldn't find any reference to one, but this film ends with an unresolved murder. Dave, have you seen other "wuxia" movies? For example, Crouching Tiger Hidden Dragon, Hero, The House of Flying Daggers, etc. I wondered how The Banquet compares. I do find Zhang adorable and she was stunning in 2046. Yep to question 1 and Yep to statement 2. How does it compare? As I said above I did find it wordier than usual with what seemed to be less action, n.b I have edited the review - I had left out an important word which I only noticed when I started this reply. The action was beautifully choreographed and included all the usual leap, bounds, floating through air that those other 3 films had. When they were in the open it was marvellous but then when they transferred back into the palace then the action was more confined, when used, and instead you got the political machinations between the various parties. Personally I'd rate those three higher than this and maybe have this alongside Curse of the Golden Flower which again seemed to me to be less action more words. Overview: When Kym (Anne Hathaway) returns to the Buchman family home for the wedding of her sister Rachel (Rosemarie DeWitt), she brings a long history of personal crisis, family conflict and tragedy along with her. The wedding couple's abundant party of friends and relations have gathered for a joyful weekend of feasting, music and love, but Kym – with her biting one-liners and flair for bombshell drama – is a catalyst for long-simmering tensions in the family dynamic. Filled with the rich and eclectic characters that remain a hallmark of Jonathan Demme's films, RACHEL GETTING MARRIED paints a heartfelt, perceptive and sometimes hilarious family portrait. My Thoughts: hmmmm what do I say. I find this a strange film to write about here. Did I enjoy it? No. I found the whole environment grating, I honestly have to say that I hope I never go to a wedding with all that kerfuffle. Aspects of the wedding had no rhyme or reason like why all the Indian bits and bobs with the Indian meals, sari's for the bride and bridesmaids, Indian elephant shaped wedding cake flavoured with tumeric and using a kukri to cut the cake. Then the reception with about 10 different bands and performers. The cast came over well and must have put in good performances to get such a reaction. This film has been discussed at some length before. I was much the same as you. I thought it was actually quite brilliant, but I just couldn't get past the characters and that awful wedding. Yep just been reading through some of the discussion, interesting viewpoints but then again that goes to show the difference between different people after viewing the same item. If we all liked and thought exactly the same then what a boring world this would be. I did say that I couldn't recognise anyone in it. That it isn't the British way to be like that so no-one I knew would suffer their antics. Glad I live in Herts. One film that came to mind whilst watching this was Black and how the sibling rivalry was handled there. I don't recall whether it was ever stated which sister was the elder but it was obvious that there had been and was still rivalry between them. Kym with her addiction and the accident made her front and centre in the family circle. She then went away for hospitalisation and re-hab which allowed Rachel to move into the family spotlight. Now with the impending wedding Kym comes back and takes back the family spotlight and as far as Rachel is concerned seems to be trying to take over the full wedding cycle spotlight. This leads to conflict and we do see some resolution but not all by the time Kym departs back to re-hab. In both films the rivalry comes to its head at the pre-wedding dinner but in Black it had been shown but not stated until the blow-up whereas in this film we have to get the rivalry from the off as we meet everyone just before the pre-wedding dinner and we have to learn of other causes of the conflict. By the time of the wedding the sisters had resolved their differences in both films but here there was still some outstanding family confilct left unresolved. Overview: From Mamoru Oshii, the world-acclaimed director of Ghost In the Shell, comes an award-winning story of an exciting but endless war with heroes too young to understand the meaning of their battles. A group of eternally young fighter pilots known as Kildren expreience the sudden loss of innocence as they battle the enemy in astonishing dogfights above the clouds. With his only childhood memory consisting of intense flight training, the fearless teenage pilot Yuichi's dogfights coexist with his struggle to find his missing past. When his beautiful, young female commander Suito is reluctant to discuss the fate of the pilot that Yuichi is replacing – or the strangely perfect condition of that pilot's former aircraft – Yuichi's curiosity becomes heightened. My Thoughts: A strange anime. Mamoru Oshii appears to have used multiple film techniques with this film. There appears to be real film backgrounds, CGI animation and traditional cel animation in use at various times plus apparently all the aerial sequences were filmed in 3D-CGI. Much of the cel animation is used within the character interaction and ground based sequences and is very flat with very little depth. The film itself is set in an alternate history where wars are now fought between corporations to avoid harm to the populace. The combatants in the wars are easily replaced clones called Kildren. 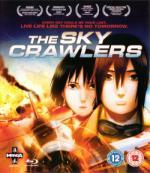 This film is about a fighter pilot Yuichi Kannami. Yuichi is deployed to a front-line squadron and upon arrival he tries to find out about his predecessor. Overview: After 50 years the ultimate nightmare returns in stunning high definition on Blu-ray, with superior picture, spine-chilling sound plus a host of extras. More chilling than ever before, Alfred Hitchcock's landmark masterpiece of the macabre stars Anthony Perkins as the troubled Norman Bates, whose old dark house and adjoining motel are not the place to spend a quiet evening. No one knows that better than Marion Crane (Janet Leigh), the ill-fated traveller whose journey ends in the notorious shower scene. First a private detective (Martin Balsam), then Marion's sister (Vera Miles) search for her as the horror and suspense mount to a terrifying climax where the mysterious killer is finally revealed. My Thoughts: OK this is only the second Hitchcock film I have seen all the way through, the other being The Birds although that was many years ago, and to be honest this film has left me feeling underwhelmed. I knew about the infamous shower scene from this and also via the many spoofs of it, maybe that is what did it for me or maybe I had my expectations set too high. It was nice and suspenseful up to murder one and then built up again nicely to murder two but then seemed to tail off to its conclusion. "3"? That's "3"? For Psycho? Yep for sure. I was toying with a 2 but thought that the film was better than that even though I didn't really enjoy it. As i said above it was suspenseful but then tailed off as far as I was concerned.